Sharon High School has a world record holder, tenth grader Vinay Kulkarni, who solved the most amount of rubix cubes solved while jumping on a pogo stick. Kulkarni broke his record while jumping at Cottage Street School, with help from people in the school district and the town helped him throughout the process. Kulkarni says that it takes him “roughly” about twenty seconds to thirty seconds to solve a rubix cube. “So we have a ton of Rubix cubes in here, he’s always been into Rubix Cubes. He can do it ridiculously fast — it’s amazing,” said Fortin. “Something he wanted to do this year was to start a cubing club so I told him that I would be his advisor for that, but it was really hard because there wasn’t a whole lot of student interest in it. I think he went this route instead so he can practice and do something cool and different instead,” added Fortin. 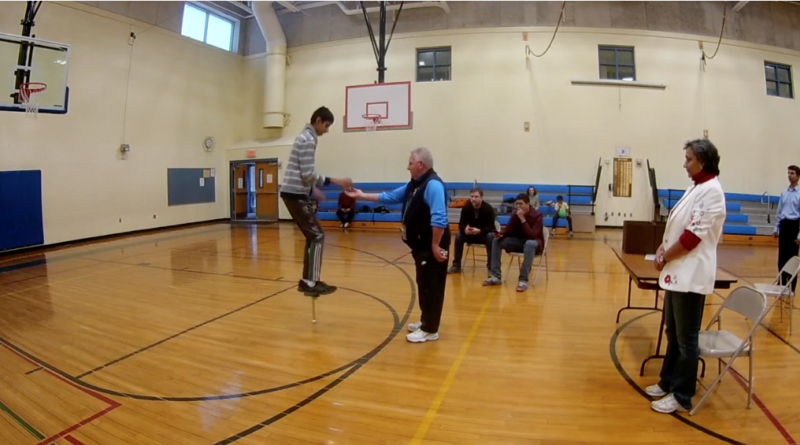 Kulkarni says that it took him about a few weeks to months to learn how to jump on a pogo stick. Kulkarni says that he usually practices outside when the weather is nice. “It depends. When the weather is [sic] nice I did it outside, but now I do it in the basement. One time I did it in the high school itself, but I jumped to break the record at Cottage Street School,” he said. Fortin adds that he practices a lot. “He practiced a whole bunch for several months. Outside of school, outdoors, and then his mom contacted me to find a place inside the school. I worked with Dr. Libano and Mr. Haven, the head custodian, to figure out a place where he could do it and practice here, or in the district, and they were able to put that together for him,” added Fortin. Kulkarni tried twice. The first time he solved one hundred cubes but the video shorted out and could not be submitted. “He actually tried twice. The first attempt he did one hundred cubes on the pogo stick but the video shorted out so they couldn’t submit it, so then he did it again and got the sixty-five cubes and got the record,” said Fortin. At Cottage Street School, teachers from different schools came to keep track of the record-breaking process. “The Guinness Book of World Records actually isn’t present. You have to follow all of these directions. There has to be a person who is the time keeper, there has to be a person who is videotaping, there has to be a person who is handing him the rubix cubes, and then there has to be someone taking pictures,” said Fortin. “So the Guinness Book people will then get all of that information once you submit it and say whether or not he got it,” said Fortin. Kulkarni says he wants to try to break his record and get at least one hundred. “I’m really proud of my accomplishment and a whole bunch of people around the world know,” said Kulkarni. Congratulations Vinay on this incredible accomplishment!